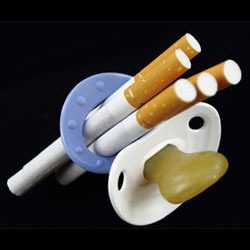 A newly published study found that on average children exposed to high levels of nicotine in utero scored 21 percent lower in areas such as reading speed, single-word identification, spelling, accuracy, real and non-word reading, and reading as compared to classmates born to non-smoking mothers. Yale School of Medicine researchers have found that children born to mothers who smoked more than one pack per day during pregnancy struggled on tests designed to measure how accurately a child reads aloud and comprehends what they read. 3 Comments on "Children Exposed to Nicotine in Utero Have Lower Reading Scores"
as a child of the fifties, who’s mother and many others during the fifties smoked, i can attest to this problem with reading and word skills. i am high on the side of working with numbers and calculations, but reading and writing is still an issue in my fifties…. you might call it dyslexia, but i think many children of that era were damaged by the barrage of smoking, hell, the doctors would smoke in the exam room…… thank you phillip morris. Well then, I must be a genius, my mother and dad smoked, (grand parents, grand uncles and aunts and uncles and aunts and cousins, and I still had a college freshman reading level at the age of 12. I also had problems with higher math, but these are typical problems of gifted/learning disabled that have nothing to do with smoking. I also tested at 137 IQ at that time as well. (Not that I’m all that and a bag of chips), but this study is skewed and not accurate. My mom smoked like a chimney and I’m a genius at spelling. I think it has more to do with socioeconomic factors and a combination of unhealthy behaviors that are likely to affect fetus health in utero, which in turn mirror individuals with high levels of nicotine usage.